Kristina Halvorson is the CEO and founder of Brain Traffic, a consultancy that delivers content strategy, large-scale audits, and digital content development to clients around the world. 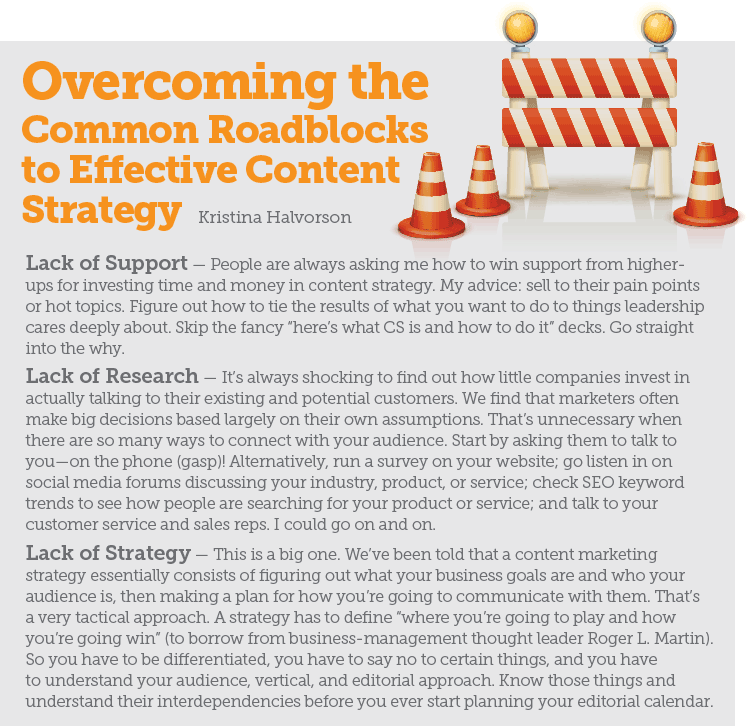 We got some straight talk on what content strategy means to her, how to build your long-term editorial plans, and why content marketing might not actually be what your business needs. Like we said—straight talk. Q: You started working in what is now content marketing strategy around 2008. That’s a lifetime ago in the world of marketing. How has it evolved? KH: I came into the field through user experience design, so I was very focused on websites and how companies use them to serve customers. I was keenly aware of the content marketing movement early on, and a huge problem we saw was that clients had so much content that it was almost getting in people’s way. I’ve watched marketers get really excited about content but not know exactly what they are getting from it or why they are doing it. Research is now showing that people are developing it and spending money on it, but a low percentage of companies can demonstrate that it’s working. Recently, people have become disillusioned with content marketing as something you have to do, and instead they are becoming more focused on what they produce and why. Q: So, how are people approaching it now? KH: Certainly, some marketing higher-ups are interested in the traditional sales funnel, so they are still excited by what they get from an exposure perspective—shares, time spent on-site, sales, and other metrics. But more-mature companies want to see why they are doing the content work. Most of it is to drive leads and then plug that content back into the larger sales cycle in a measurable way. Of course, ad agencies create content that wins awards, and brands love to win awards! But smart companies are looking at ways to be more judicious in how they spend money, and content marketing might be a part of that mix, or it might not. Now they are asking, Does it make sense for my strategy and purpose? You have to avoid the trap of the marketer’s ego. Q: Do you have an example of this? 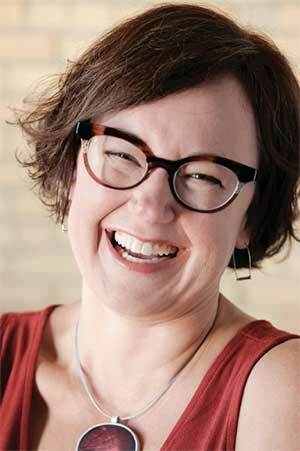 KH: I recently saw a woman from Allstate give a speech at a conference. She explained how Allstate was doing content around the aspects of owning a home and had produced a video about raising chickens in your backyard. The video went viral, so they were excited and wondered if they should do more stories about raising chickens. But they weren’t able to vet whether that was getting them qualified leads. So you have to be careful about ego metrics. As a company, you can use brand perception-shaping content, but you also need to put consideration into the part of the customer journey where they want to learn about the products. Q: It seems nowadays if you are playing catch-up on content marketing practices, you’ll be behind again by the time you catch up. How important is it to make it a priority to keep up with content marketing evolutions? KH: We are all catching up all the time, but not everything that is new is for you. I tell people to slow down and set strategy. Some people think their strategy is to become a world leader in delivering content to whomever. That is not a strategy. A strategy sets goals based on where we are now, picks a direction, and makes a set of integrated choices. There will be things you say no to. Companies that are evolving in this space have taken time to research and challenge their own assumptions. Marketers don’t like to say no. They fear missing the next big thing. Innovation doesn’t always mean doing new stuff. Sometimes it means reinventing yourself as a company that prioritizes the holistic customer experience. It could also be the super-unsexy stuff, such as fixing the checkout experience online or killing your Facebook Page because only 100 people look at it. Evolving is what sets people apart. I like unsexy marketing. I like the pragmatic stuff, the good stuff that will help support the customer through all stages of the buying cycle. Q: So, what does it mean to create a content strategy as a brand? 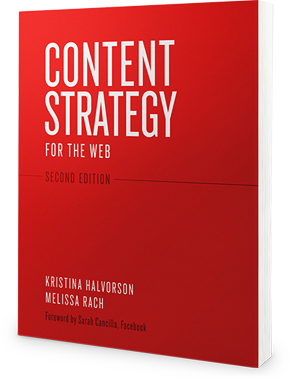 KH: Content strategy guides planning for creating, delivering, and managing useful, usable content. And the useful, usable part is about putting the customer in the center. Content strategy takes into consideration brand strategy. It’s not about driving brand awareness—that’s advertising. It’s making the content useful and usable for the customer through their life cycle. Q: Can you tell us some of the reasons a brand might want to start creating content itself? KH: There are a number of reasons creating content might be the right approach for your business—shaping brand perception, improving your SEO standing, building out email lists, or generating qualified leads. Those last ones are pretty concrete. If you are going to say how content will do those things, you better have metrics in place. Q: Once a company has set those goals, who should lead the charge? KH: That depends on what your editorial mission is, where your content will live, and what your point of view is. Cruise companies and brands such as L.L.Bean, for example, have been creating lifestyle content for years via email and other channels. Their idea of treating content as if it’s a magazine is different. If you commit to something like that, you better have some sort of editor, or a beat reporter called a content marketing specialist. If you want to set up a content marketing team, look at a magazine and draw parallels between how people working in print translates to a digital environment. At Brain Traffic, we are just now readying to launch a podcast as a new form of content with different goals. We have a content marketing manager, and our subject matter experts are creating the content. We have a proofreader and outside support for web and podcast production. It all depends on what works with your infrastructure. Q: How should marketers build a successful business case for a content strategy budget? KH: You have to ask yourself what any marketer should always be asking: How do I sell this product to this audience? And it depends on who the audience is, of course. If you have a boss who is super into eyeballs on his or her advertising, focus on the opportunity in SEO and on driving people into learning more about products and services, then put teeth behind it by proposing numbers. If you have leadership interested in brand perception, go that route. If you have leadership interested in the competition, do some research on what your competitors are doing and how you can get to that level. Having said that, if you think content marketing is a huge opportunity for your organization, you have to challenge that assumption. 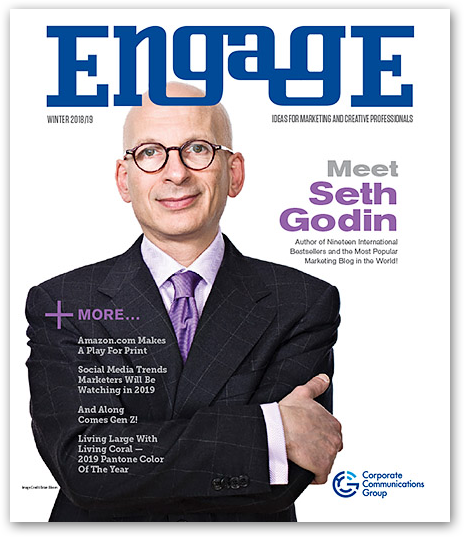 I have asked CMOs why they are doing a content marketing push, and they have said it’s because experts told them to. That’s a bad reason to do anything. So, we went back and looked at what their goals and needs were and whether they could differentiate in this area. But the CMO had to be brave and know that when we were done with the work, content marketing might not have been for them. Any good CMO has to make smart decisions about how to create brand awareness, get conversion, and retain customers. Sometimes not everything is right for your business, including content marketing. Q: Can you explain the importance of a traffic expert who can ignite content by using SEO and other expertise? KH: What you have described is how the brand makes connections between the editorial, the search, and the customer journey, which helps make that content findable. Now that you’ve made those connections, it’s time to think about the connection you’re making with your architecture. Once the audience hits that content, how are you filtering it? Is it responsive across different screens? Are you managing on the back end to be sure it’s up-to-date? All these things get tied together. The more closely knit they are, the better your content will perform. I see a lot of content marketing efforts only happening on the editorial side, and they are missing the potential of what they are creating. It’s much smarter to do less, make sure it’s of super quality, and do more with it than to just crank out content and hope something hits. Q: Can you explain how brands can get the most from content after it’s published? KH: Regarding repurposing content, I think if we are looking at it from a purely technical perspective, this is a tactic, and it takes effort. For example, you can start with a webinar in which someone is giving a presentation and there is a deck and a live Q and A. Now you have a transcript that can become blog posts and be turned into a podcast. It’s taking the same content and giving people different ways to find, access, and consume it. You can break up all these pieces of content and distribute them across various channels, but again, take into consideration how your audience is going to use it. Q: What are the best measuring sticks for performance metrics of an editorial strategy? KH: Assign metrics to those areas that answer the question, Why am I doing this? You should measure brand perception and brand awareness, of course. But if a company can say, “Customers who return to our website three or more times are more likely to buy,” that’s a good lead. Tracking the behavior of someone who comes from an SEO result is also important. We want to understand what that lead accomplishes. People are sick of the same old crap from pundits who promise you the moon. How do you challenge the assumptions that you are being sold to 24/7 and start grounding your choices in the reality of your company and customers? Too often, marketers get mired in their checklists and to-do lists, and they mistake activity for productivity. If you are being productive, you are getting meaningful results for your business and customers. Q: We talked early on about how far content marketing has come, but where is it all going? KH: I think we’ll see far less content marketing in a few years, and only from certain types of industries, such as service industries more so than product-driven industries. For the folks who continue content marketing, I think we’ll see a much deeper consideration of audience intent versus interest—what do people want to do when they encounter our content? Finally, I know marketers are really being pressured to demonstrate value and results from the content they’re creating and promoting, so any tools or systems that help them tie their efforts to conversion and retention will be key. Q: What is the biggest aha moment or take from your newest book? KH: What I hear from people is, “Oh, it’s not just me! I’m not the only one dealing with all these content problems!” Just finding out that there’s a framework and set of tools to help you sort out your content—for strategy, road map, implementation, measurement—seems to be a big discovery, along with understanding the entire life cycle of content and how we can and should be connecting the dots between those phases.